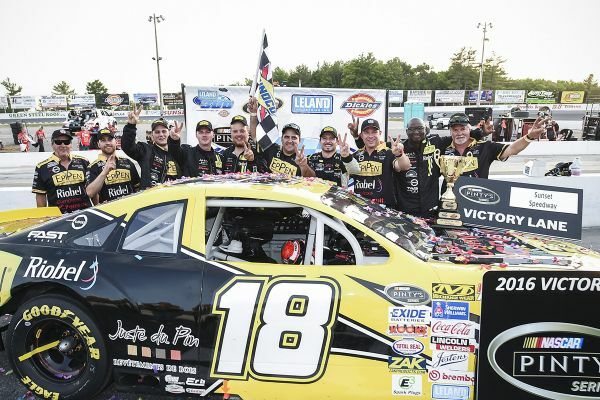 Alex Tagliani won Round 2 of the 2016 NASCAR Pinty's Series held Saturday evening at the .333-mile asphalt oval at Sunset Speedway in Innisfil, Ontario. The Laval, Quebec driver started the 300-lap race from 10th place and took the lead with his EpiPen/Riobel/CanTorque #18 Chevrolet for the first time in the Leland Industries 300 on lap 58. Tag lost the lead to pole sitter Cayden Lapcevich of Grimsby, Ontario 20 laps later. Following the fourth caution of the 300-lap race, Tagliani came out of the pits first on lap 168 and never looked back to score his third series win. "A super team effort that resulted in a team win for he second consecutive year at Sunset Speedway," Tagliani said after the race. "The number 18 EpiPen/Riobel/CanTorque car winning on June 18, one day prior to Fathers Day. What a nice gift for my dad! I went through a lot of emotions during the event because the atmosphere was quite aggressive out there and more competitive. I had to fight until the last lap. Of course, I lapped the field last year and the win seemed easier then. This win I also dedicate to all my sponsors. The Tagliani Autosport crew gave me a fine car and they were number one during the pit stops. It's good to start my NASCAR Pinty's season with a win which will enable us to close the gap in the Owner championship." Lapcevich finished second followed by Larry Jackson, Adam Martin, Kevin Lacroix and D.J. Kennington. Only six cars finished on the lead lap. 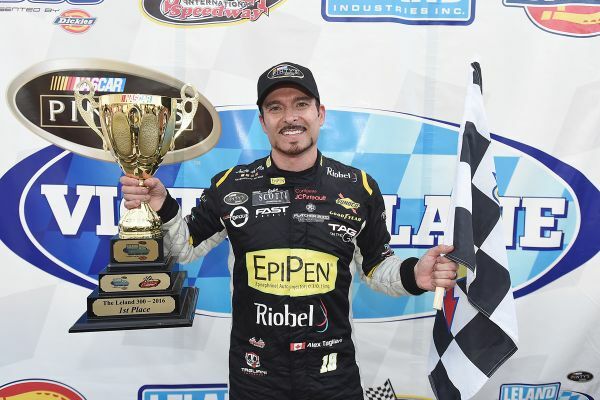 Last year, Tagliani scored an epic win at Sunset Speedway, when he became the first driver in 10 seasons of the series to lap the entire field. The Leland Industries 300 will air on TSN2 on Saturday, June 25 at noon. The NASCAR Pinty's Series moves to Vallée-Junction on June 24 for the Chaudière 300 at Quebec's Autodrome Chaudière.